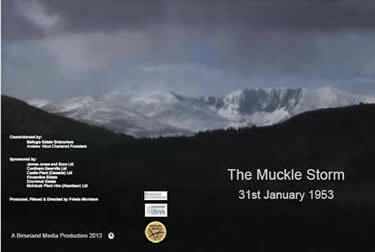 Produced, Filmed & Directed by Frieda Morrison of Birseland Media Productions, this excellent video records Robbie Mitchell, Eunice Adams, Bert McIntosh, John Copeland, Ian Cameron, Bill Blackhall, Andy Burnett, Sandy Hogg, Mary Munro and Ian Smith all telling their own story of that terrible gale. To order your own copy, by return, please send a cheque, payable to Andrew Nicol Chartered Forester, for £15, to: Andrew Nicol Chartered Forester, Deeside Activity Park, Dess, Aboyne, Aberdeenshire AB34 5BD. In early April 2013 we plan to announce who will be taking this project forward for us. If you have any records of the Great Gale of 1953 please do get in touch on marketing@andrewnicol.com. 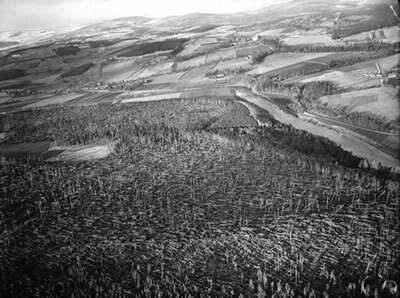 Aerial view of Ballogie Estate showing acres of timber flattened by ’53 Gale. John Birnie, Cordiners Sawmills Chief Engineer provided this, from his “grinnies box”. Reproduced here by kind permission of Aberdeen Journals.